Molecular dynamics simulations have become instrumental in replacing our view of proteins as relatively rigid structures with the realization that they were dynamic systems, whose internal motions play a functional role. Over the years, such simulations have become a central part of biophysics. Applications of molecular dynamics in biophysics range over many areas. They are used in the structure determination of macromolecules with x-ray and NMR data, the modelling of unknown structures from their sequence, the study of enzyme mechanisms, the estimation of ligand-binding free energies, the evaluation of the role of conformational change in protein function, and drug design for targets of known structures. The widespread application of molecular dynamics and related methodologies suggests that it would be useful to have available an introductory self-contained course by which students with a relatively limited background in chemistry, biology and computer literacy, can learn the fundamentals of the field. 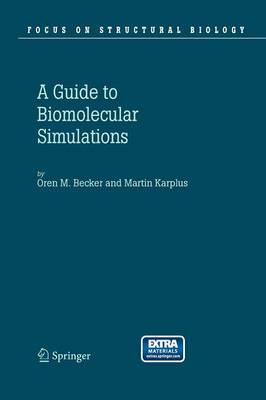 This Guide to Biomolecular Simulations tries to fill this need. The Guide consists of six chapters which provide the fundamentals of the field and six chapters which introduce the reader to more specialized but important applications of the methodology.